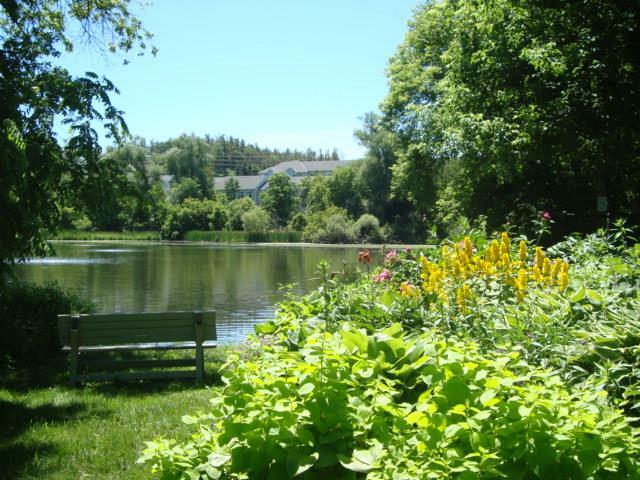 The community of Bogart Pond has been my home for close to fifteen years. After a very messy separation, my daughter and I moved here to heal....and I've loved this place ever since. I call my home the treehouse because I can literally see trees from every window. There is a real sense of having somehow escaped to some place in Muskoka here...even though you're right in the middle of Newmarket. Every day I get to walk my dog along the wooded trails to the pond . Neighbours greet us and share stories, I can hear birds and watch squirrels and rabbits go about their business and I feel my shoulders drop once again and I relax...no matter how tense the day has been. Every season is beautiful here. Every window has an extraordinary view. Every home is remarkable. If you'd like to know more about this extraordinary community of executive townhomes and condo apartments , please contact me. You'll find more pictures underneath the "About Me" tab at the top of my website. IS THE REAL ESTATE PARTY FINALLY OVER ?? NOPE....it's just a different kinda party....one where you actually talk to people and get home safe. The market is simply more normal now. Buyers can actually afford their dream home...and buy it in most cases without entering into a multiple offer situation where they will very likely be out bid. They can take more time, make sure their finances are in order, often have a proper home inspection done and feel confident about their purchase. And what about Sellers ? If a home is realistically priced, has been taken care of and shows well....chances are a Seller will be very happy with the sale outcome...often receiving more than list price. So...if you're a Buyer...you have a lot to choose from... and trust me..EVERYONE wants to meet you. It's the absolute perfect time to take the leap. If you're a Seller...the great news is that when a Buyer comes to your home, in most cases now...they are properly pre-approved and can actually afford to buy your home as opposed to Buyers who showed up in the feeding frenzy last year and often didn't close on properties because...as it turns out...they didn't have the money. Thinking about making a change ? Message me and let's get started. No pressure...just free advice and a happy transition for you some time in the future. IF YOU'RE ALREADY THERE...STAY PUT. LET'S GET AT IT !!!! Selling your home...or buying one...maybe for the first time.... is contemplating a change that will possibly involve the biggest financial decision of your life, and it's not an easy process. So....... why would you trust me to help you ? The truth is that you shouldn't...not right away. I'm willing to earn your trust by providing you with the information that you need to make educated decisions about buying or selling a home, and it won't cost you anything or "hook" you into giving me information that sends you repeated automated emails. I've been a full time, award winning Realtor for eighteen years and I pride myself on having a very high client referral rate. I won't pressure you. I'll take the time to make sure you know exactly what you're doing. I'll be with you...every step of the way. Ready When You Are !!! “Suzanne knows her stuff. She lives in our area and knows everything about the homes here. (Bogart Pond ). We now know how to de-clutter and look forward to decorating our new home and staying there ! 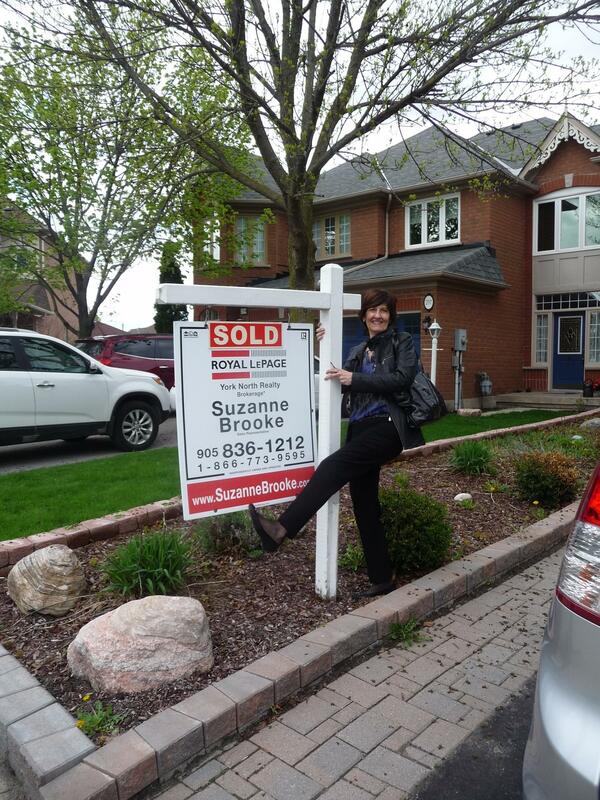 "If you are reading this on Suzanne Brooke’s website, then you have already made your first smart move in buying or selling your Newmarket home. Please spend a few more minutes here and read Suzanne’s simple, honest, and direct message. " " After more than 34 years in our home in Newmarket, we decided in mid-February 2016 to sell it and move to eastern Ontario. But how do you choose a Realtor to help sell the home you have ‘customized’ for 34+ years? Call it luck, fate, destiny – whatever you like – but a Google search landed us at http://www.suzannebrooke.com/. There was just something about it; we connected with the spirit of the words immediately. A few days later, we met Suzanne in person and it felt like renewing an old friendship – even though we’d never before met. From the beginning, we knew we could count on her for straight talk, solid advice, and just the right touch of humour to keep us going. Our home needed a make-over if it was going to be popular in today’s market, we learned. Then Suzanne advised us how to proceed: 1) declutter, 2) repaint strategically, and 3) work with her chosen staging team to present our home’s best face to the world. It was a tough job and Suzanne artfully choreographed each step along the way…when to publish the listing, hold the Agents’ Open House, host the public open house, and even when to receive and review offers. Her timing was perfect and she never missed a cue. Five weeks after that first meeting, our house made its debut in the real estate section of the Newmarket Era-Banner. It sold in five days for thousands above the asking price. So, if you are looking for a skilled professional to help you buy or sell your home, look no further. Suzanne Brooke is an accomplished artist in this field – you won’t find a more talented, dedicated, or ethical partner in the real estate arena.